This panel contains a personification of Hope and is one of three figures in a three light window containing virtues. The other figures depicted are Charity and faith. “It bears all things, believes all things, hopes all things, endures all things.” Secondly, from a temporal perspective, love lasts, while “Hope isn’t hope if its object is seen”, and faith gives way to possession. In this depiction Hope looks heavenward apparently fulfilling her namesake virtue and hoping for a divine union and eternal happiness in the afterlife. She holds an anchor, which is one of her many attributes, signifying safety and security. The anchor in particular has been used in Christian art as a disguised form of the cross, which may be the case here as the crossing bar of the anchor appears to be made out of wood. The way that the rope wraps around the anchor emphasises the steadfastness and security of hope. In traditional Christian philosophy there are Seven Virtues by which all good, faithful people should live their life. They are separated into Cardinal and Theological virtues which were adopted by the early church fathers and are prominent in Greek history, with Aristotle and Plato for example. In particular Plato wrote about the Cardinal virtues: Prudence, Temperance, Courage and Justice in his philosophical work Republic. Theological virtues on the other hand appear throughout churches and are outlined by Paul the Apostle in his biblical book Corinthians as being far superior as they are only attained by people’s relationship with God. Throughout Christian history the Theological virtues: Charity, Hope and Faith, have been important in teaching moral standards and subject matter for artworks such as sculpture and stained glass. This quotation is a section of a longer passage in Corinthians which concludes in stating that Charity (often interpreted as love) “bears all things, believes all things, hopes all things, endures all things.” Furthermore that charity i.e. love, lasts while “Hope isn’t hope if its object is seen”, and faith gives way to possession. The window was designed and made by the workshop of Heaton, Butler and Bayne. 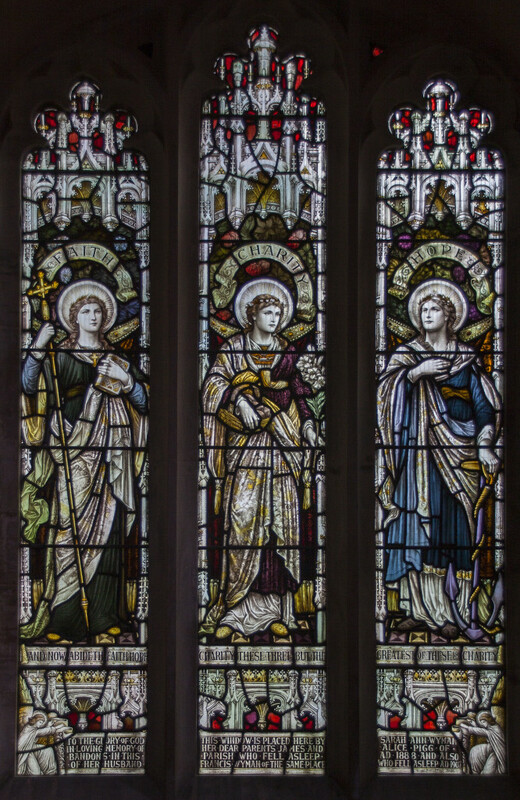 This popular and prolific firm first started creating windows for churches in 1852 when it was founded by Clement Heaton in London. Over the years James Butler and Robert Payne joined Heaton and the firm and their sons went on to produce works until 1953. The style of this window is typical of others by the workshop from the 1880s onward. Single, full-length figures, in architectural niches with their names on scrolls above them and a relevant biblical quote below. In addition – and typical also for windows by HB&B which are not of single figures, but scenes spread across all lights – is a dedication inscription written on a scroll held up by kneeling angels in the bottom two corners. 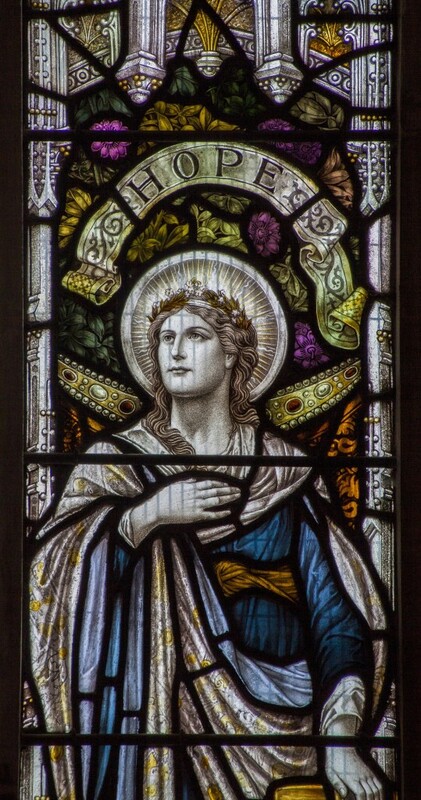 This can be seen in many of the windows across the country, especially in All Saints, Stamford. 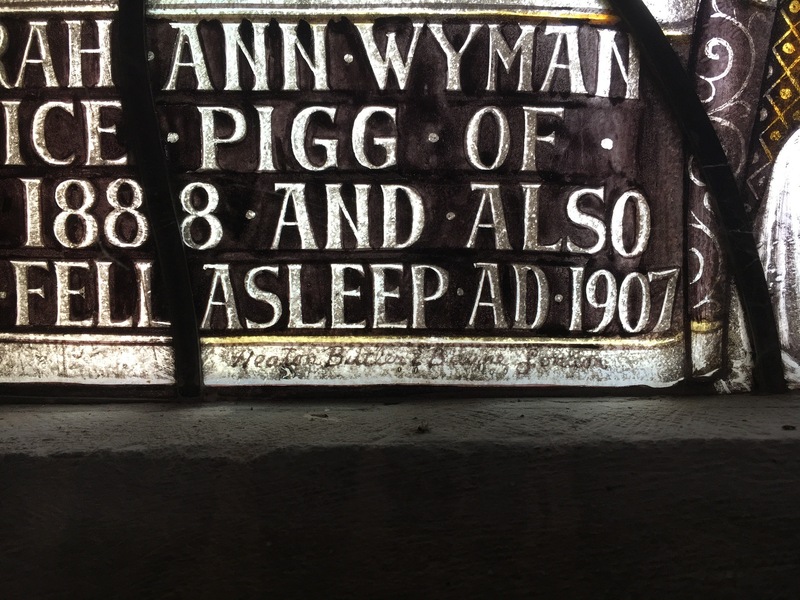 Often in light four at the bottom can be found the written signature of the workshop: “Heaton, Butler & Bayne, London”, as is the case in this window (and see also All Saints, Stamford for a better image). The signature of Heaton, Butler and Bayne can be seen at the bottom of the glass in the white strip. it is hand drawn and very faint. An accumulation of dirt makes it difficult to read. The church itself was an absolutely fascinating place with so much to explore from a mermaid font, to a graffiti Elizabethan man, as well as an ornate tomb of Richard de Anstey. I found the church open, clean and very welcoming. “St George’s is a medieval building dating from the 12th Century, (c.1170). 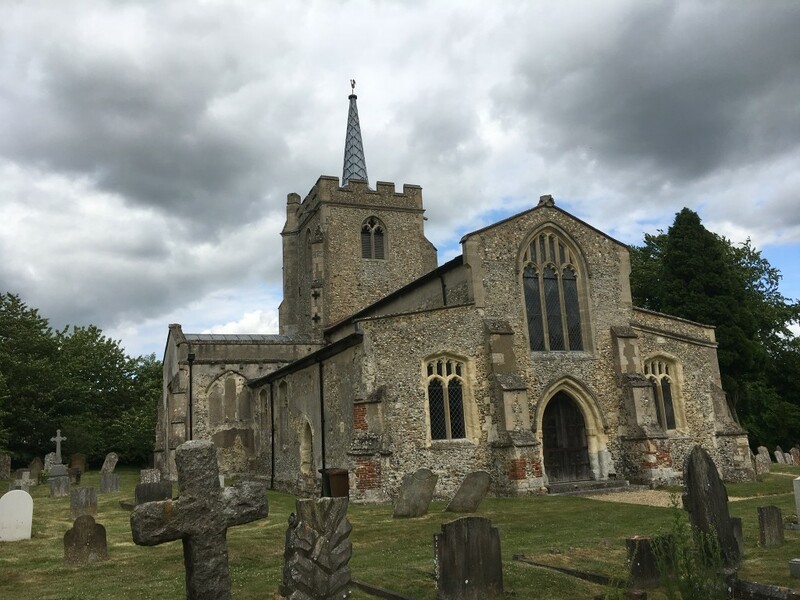 The Church appears in the book “Britain’s 1000 Best Churches” and receives many visitors from the U.K. and abroad, particularly the U.S. as there is a wartime connection with a U.S. airfield nearby. Records show a flint and rubble church stood here in Saxon times. It was rebuilt around 1200 by Sir Richard de Anestie whose ornate but damaged tomb is in the church. Some of the material from the castle which stood behind the church is thought to have been incorporated in the building. The church is noted for its abundance of early graffiti, including some from the 13th century and shows military helmets and shields and that of an Elizabethan man. The Norman font is one of only two known in England to be decorated with mermen holding their tails. The church is of cruxiform design and the Central Tower holds a ring of six bells, the earliest being from the 15th Century and the last from 1778. Plato, Book IV, Republic, 381BC.